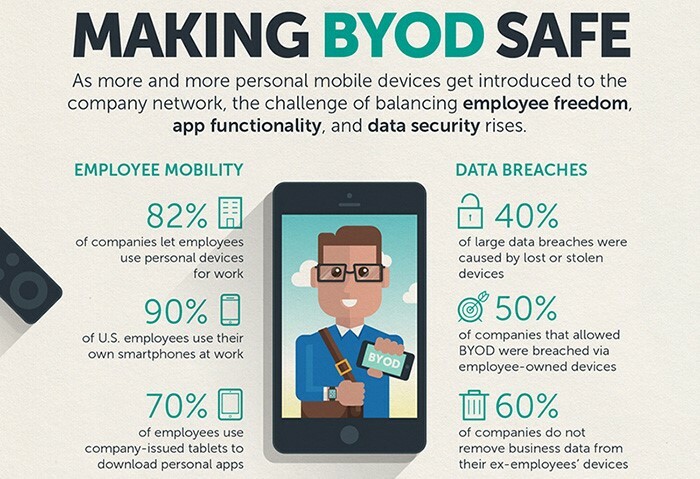 BYOD remains both a major opportunity and challenge for enterprises. By following the right approach to identifying BYOD risk and developing effective BYOD policy it is possible to capitalize on the benefits of BYOD without adding significant risk. If your company allows employees to bring their own computing devices to the workplace – whether they are smartphones, tablets, or laptops – you need a BYOD security policy. Initially, employees used only company-issued devices in the workplace. Today, smartphones and tablets have proliferated in the consumer market to the point that nearly every employee comes to work with their own internet-connected device. This means higher potential for an employee introducing security risks to your company. It’s one thing for an employee to bring a personal device to work and use it strictly for personal communications. This practice can still create risks, but the most substantial security risks are associated with employees using personal devices to conduct business, whether simply sending work-related emails or actually accessing secure company applications from their own smartphones or tablets. The difference is essentially that in one case, employees are using their personal devices at work; in the other, employees are using their personal devices to conduct work. Devices that are brought to the workplace but do not have access to the company network are not usually problematic; however, due diligence is necessary in all cases with strict, clearly defined BYOD policies and enforcement. BYOD security is often a challenge for enterprises and SMBs alike. This stems from the fact that in order to be effective, companies must exert some form of control over smartphones, tablets, and laptops that are not owned by the company but are employees’ personal assets. As BYOD has become increasingly common and awareness of security risks has grown, BYOD security policies are becoming more widely adopted and accepted by both companies and their employees. 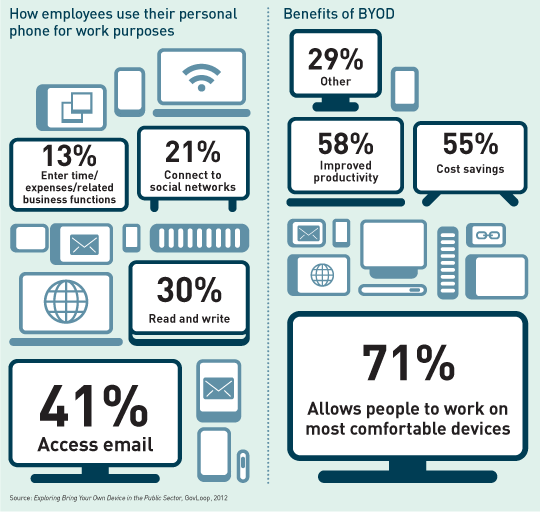 BYOD is prevalent in the workforce. In fact, a November 2014 survey from Tech Pro Research found that 74 percent of organizations either already allowed employees to bring their own devices to work or were planning to do so – according to more recent figures from Trend Micro, that number is now over 82%. Companies adopting BYOD benefit from reduced hardware and software costs, but at the same time, BYOD places additional responsibilities on IT departments, which must maintain the devices as well as ensure that the practice does not introduce unnecessary vulnerabilities to the company network and data. 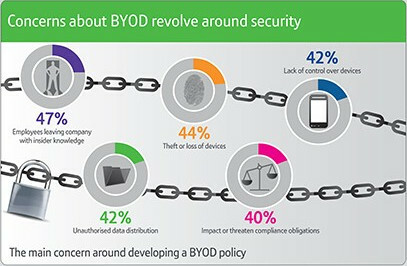 Interestingly, among the 26 percent of Tech Pro Research’s survey respondents not adopting or planning to adopt BYOD, security concerns were the most common reason cited for ruling out the practice. In 2013, a global survey of CIOs by Gartner's Executive Programs found that 38 percent of companies were anticipating that they’d stop providing devices to workers by 2016. Gartner further predicted that by 2017, half of employers would require employees to supply their own device for work purposes. These trends and predictions aside, BYOD has a momentum all its own: An Ovum survey of 4,371 employees worldwide in 2013 found that nearly 70 percent of employees who own a smartphone or tablet use it to access company data. Specifically, 67.8 percent of survey respondents who own a smartphone or tablet bring their devices to work. Among them, 15.4 percent of respondents bring their devices to work without the IT department’s knowledge, and 20.9 percent do so in spite of company policies that prohibit BYOD. These findings illustrate the likelihood for employees to use personal mobile devices to conduct business activities whether or not the company has prior knowledge and/or policies regarding the use of personal devices. In other words, companies who choose to ignore the likely use of personal devices are ignoring what could be a serious security risk. Employers have two options: either embrace BYOD by enacting BYOD policies and security measures to make the practice a safer one, or prohibit BYOD entirely and find a way to enforce it. For most companies, it makes sense to embrace the BYOD trend and capitalize on the benefits it offers, such as increased employee productivity and greater employee satisfaction through better work-life balance, while implementing security measures that mitigate the risks involved. To adapt to the growing use of BYOD among enterprises and SMBs, many companies may be inclined to jump immediately to policy creation, but that approach is often met with friction. The first step, before working on policy, is to gain both stakeholder and employee buy-in. Stakeholders will be essential to the policy planning process, providing a variety of perspectives from various departments and interests within the organization. Executives, human resources, finance, IT operations, and the security team should be represented within a BYOD project management team and can each contribute to policy development. In addition to these stakeholders, employee input is essential for creating effective BYOD policies. Blindly creating policies based solely on the company’s interests can backfire. Policies that are too restrictive or fail to offer support for the right devices will lead to a lack of participation by employees, ultimately wasting the resources the company invested in creating the policies. An employee survey is an effective way to gain data on the devices employees currently use (and are likely to purchase in the future, as these devices must be supported by your company’s BYOD policy), what employees see as advantages and disadvantages to using their own devices for work purposes, and what applications they perceive as necessary to be able to carry out business tasks on their personal devices. For instance, some employees may have concerns about their own privacy should they use their personal devices for business. 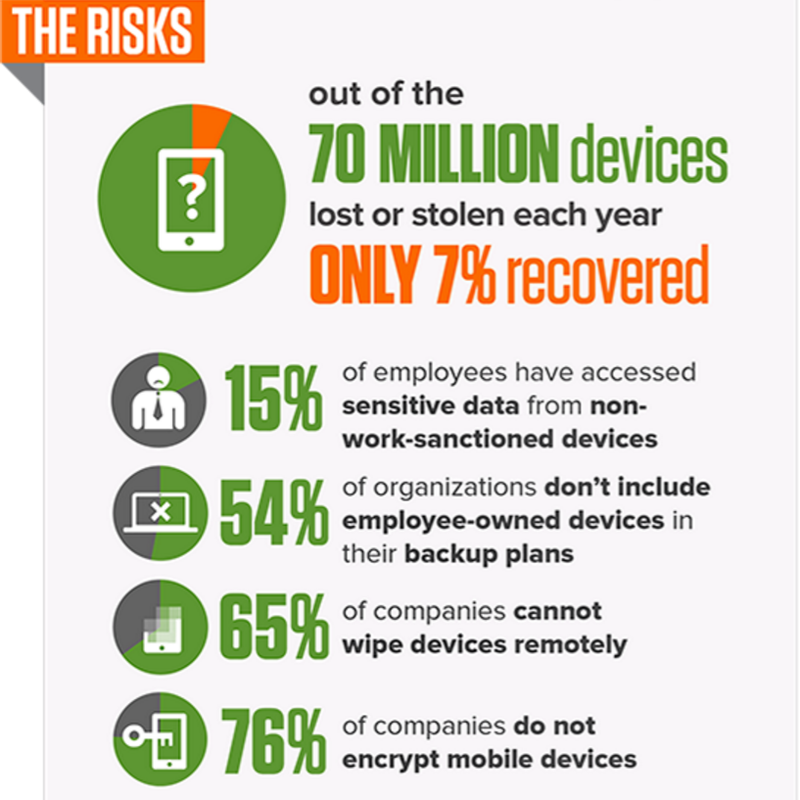 Armed with this data, you can begin to craft a BYOD policy that addresses these concerns and encompasses the full range of devices your employees are likely to use. Acceptable use: what applications and assets are employees permitted to access from their personal devices? Jonathan Hassell in an article for CIO describes a few additional components of effective BYOD policies, such as specifying the permissible device types and establishing a stringent security policy for all devices. For example, consumers may opt not to utilize native security features such as the ability to lock device screens or require passwords because these features create additional steps that inconvenience users. Employees are motivated to make use of these simple features when clear company policies exist, and even simple measures can enhance company security. Additionally, your BYOD policy should clearly outline a service policy for BYOD devices, including what support is available from IT for employees connecting to the company network, support for applications installed on personal devices, and support for resolving conflicts between personal applications and company applications. Your BYOD policy should clearly outline the ownership of apps and data, as well as the applications that are permitted or prohibited and reimbursement (e.g., will the company reimburse employees a standard use fee, pay for certain applications, or a portion of monthly bills?). 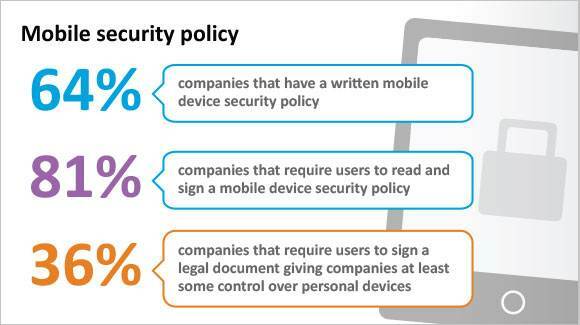 It should also outline security requirements for BYOD devices (e.g., will the company provide a mobile device security application that must be installed on employee devices before they are granted access to company data or will employees be permitted to choose their own security solutions provided they meet criteria outlined by your IT department?). Employee exits are also an important consideration when outlining your BYOD policy. When an employee leaves the company, what happens to the company data that may be stored on the employee’s device? Defining clear policies that explain the procedures that must be followed when an employee separates from the company, such as the wiping of the employee’s device by IT, should be explained in detail in written policies. Finally, risks, liabilities, and disclaimers should be disclosed in a written BYOD policy. This includes company liability for an employee’s personal data, should a device have to be wiped for a security precaution, as well as employee liability for the leakage of sensitive company data brought about by employee negligence or misuse. In addition to creating and communicating your BYOD policy, you must ensure that you have the right technology resources at your disposal. An evaluation of your current capabilities will help to identify and fill these gaps to ensure a successful BYOD rollout. Lack of oversight is one of the most common concerns surrounding BYOD implementation. Companies implementing BYOD policies need to have adequate staff in their IT support departments to help employees get set up and provide ongoing support and monitoring. Not all solutions are compatible with all devices or operating systems. Companies may opt to purchase a software solution with cross-device compatibility, or they may place greater importance on features and offer a different solution for different devices and OS. Companies should implement measures and procedures for verifying installation of security solutions on all devices accessing company data. They should also create protocols for identifying and enforcing policies related to the evaluation of the risks of various apps and determining which specific applications are deemed safe as well as which applications should be prohibited. Finally, if reimbursement is included in the BYOD policy, budgetary issues should be considered and appropriate resources allocated for this purpose. Once your systems and protocols are in place, providing ongoing employee education on the importance of acceptable use as well as basic data security hygiene is critical for BYOD success. Beyond this, the right security solutions can minimize your BYOD risk and enable your policy to run smoothly. There are several elements that should be addressed by an effective BYOD security solution. The ideal solution is one that encompasses several or all of these elements and facilitates a comprehensive mobile security strategy. Below are short descriptions of various security measures which may be used as part of a comprehensive BYOD security program. Because BYOD usage takes data outside of the control of many other enterprise security measures, it is important that organizations encrypt sensitive data at rest and in transit. Encryption ensures that the contents of sensitive files are protected even in a worst-case scenario such as a stolen device or traffic being intercepted over an unsecure network. There are some controls available with certain devices and operating systems that IT can utilize to exert control over the apps installed on an employee’s device. For instance, Apple iOS devices can be configured to deny access to the App Store, and Android devices can be configured to block the installation of apps from outside the Google Play Store or apps with inappropriate content. However, restricting an employee’s ability to download or install applications on their own devices for personal use isn’t a practical solution for most companies. These methods are similar to measures taken for parental control purposes, so naturally, employees are likely to feel as though this is an infringement on their personal freedoms. 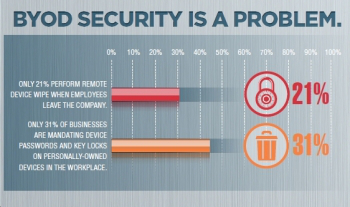 Most employees have the expectation that they will be able to use their personal devices as they choose when they’re not on the clock, conducting business, or connected to a secured company network, making other solutions more practical for BYOD security. Mobile device management (MDM) solutions offer a balance between total control for employers and total freedom for employees, offering the ability to deploy, secure, and integrate devices into a network and then monitor and manage those devices centrally. The MDM field is still finding its footing and is not without its share of problems. For instance, this article in CIO reports that some enterprises could take advantage of more advanced features available with MDM, creating a less-than-ideal user experience that’s too restrictive and leading employees to resist the enterprise’s BYOD program. Containerization is increasingly being offered in conjunction with (or paired with) MDM solutions. Containerization is a method by which a portion of a device can essentially be segregated into its own protected bubble, protected by a separate password and regulated by a separate set of policies, from the remainder of the applications and content on the device. This allows employees to enjoy full, uninhibited use of their devices on their own time without introducing security risks to the company’s network. When a user is logged into the containerized area, personal apps and other features not managed by the container are inaccessible. Containerization is an appealing solution that doesn’t limit employees’ ability to use their personal devices as they choose, while eliminating the possibility of employees using or accessing apps that don’t meet the company’s security threshold when working. Containerization limits corporate liability without impacting personal use, but on the downside, it doesn’t protect employees’ personal data on devices that are lost or stolen and must be wiped. This is a challenge that’s easily overcome with proper personal data backup. Blacklisting is a term that describes the process of blocking or prohibiting specific applications that are determined to pose a risk to enterprise security. Blacklisting is also a method some companies use to restrict employee access to apps that can hinder productivity, such as games or social networking apps. File-sharing services are another category of apps that often find themselves on blacklists, as companies fear that sensitive information could be shared with unauthorized third parties, either intentionally or inadvertently, by employees. While it can be effective by limiting access to applications that don’t meet your company’s security criteria, blacklisting is not often used for BYOD, as the process means controlling access to applications on employees’ personal devices both during work and during off-hours. Naturally, this poses an issue for some employees who enjoy playing Pokémon GO when they’re not at work. Whitelisting is simply the opposite of blacklisting. Instead of blocking access to a list of specific applications, whitelisting allows access only to a list of approved applications. It’s often considered a more effective process simply because of the sheer number of applications and websites that exist. Waiting until an employee has downloaded an app and used it to transmit data to determine that it poses a security risk is sometimes too little, too late. Whitelisting circumvents this issue by simply not allowing access to anything unless it has been pre-approved as safe by IT. Of course, like blacklisting, this can create problems for BYOD by blocking employees’ access to apps that they might want to use when they’re not at work. There are a variety of other security measures that are sometimes used as part of a comprehensive BYOD security program. Antivirus software installed on individual devices, for instance, is often a staple of such security programs. Companies may purchase a volume license and install software on BYOD devices or simply require employees to install their own and verify with IT that their devices are protected. With more malware targeting mobile devices, the risk of such a malicious program impacting the company network by way of an employee’s personal device is very real. Monitoring is another component sometimes used as part of a BYOD security program, albeit with mixed opinions. IT could implement systems that monitor the GPS location of employee devices, or Internet traffic on individual devices. While these monitoring systems can prove beneficial for detecting unusual activity or locating a lost device, many consider these solutions to venture too far into employees’ privacy. The bottom line is that BYOD security, like enterprise security, requires a multi-faceted approach that addresses the potential risks while minimizing intrusions on employee privacy and usability when it comes to personal use. Context-aware security solutions that provide control over user access, applications, network connectivity, and devices, in addition to encryption capabilities, combine the key elements necessary for ensuring enterprise security in the BYOD landscape. Enterprises embracing these solutions capitalize on the benefits and reap the rewards of BYOD, such as employee productivity and satisfaction due to greater work-life balance, while effectively mitigating the security risks that once plagued companies adopting BYOD. Is a Remote-Wipe Policy a Crude Approach to BYOD Security? We're rated #1 for intellectual property protection in Gartner's latest DLP report.